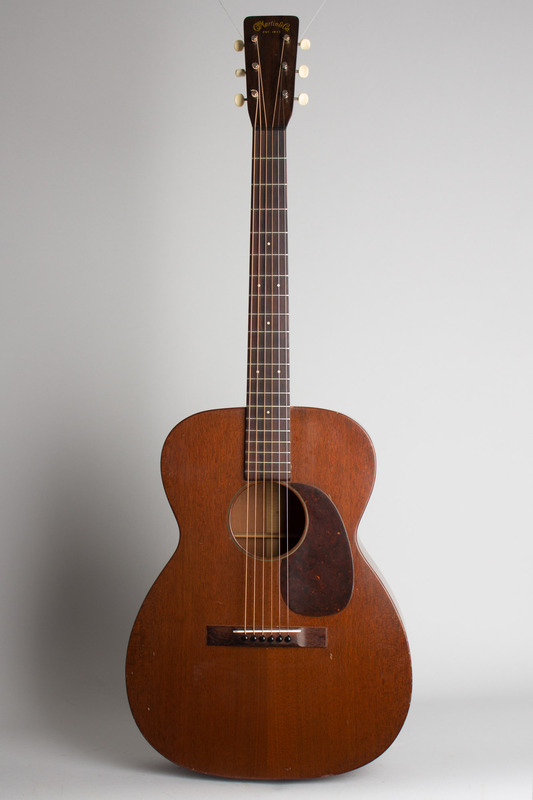 C. F. Martin 00-17 Model Flat Top Acoustic Guitar (1945), made in Nazareth, PA, serial # 93247, natural lacquer finish, Mahogany body and neck, rosewood fingerboard, black hard shell case. 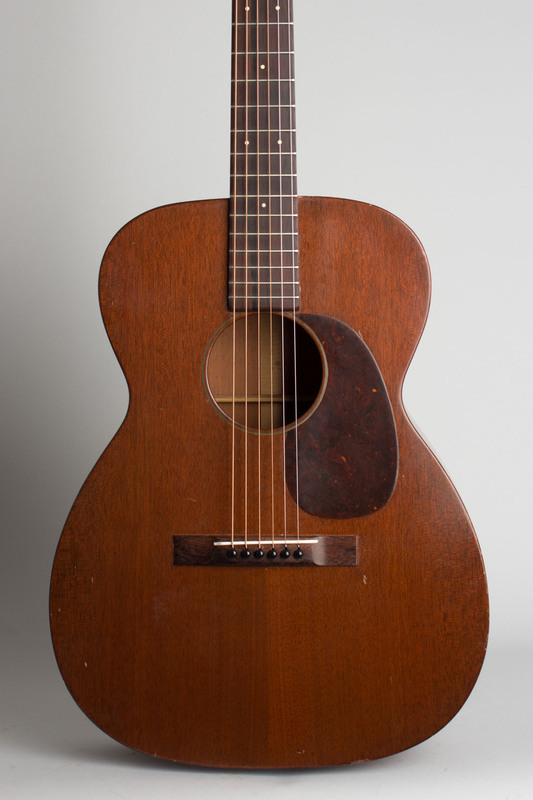 This is an extremely well-preserved wartime Martin 00-17 from early 1945, just coming up on its 75th birthday! 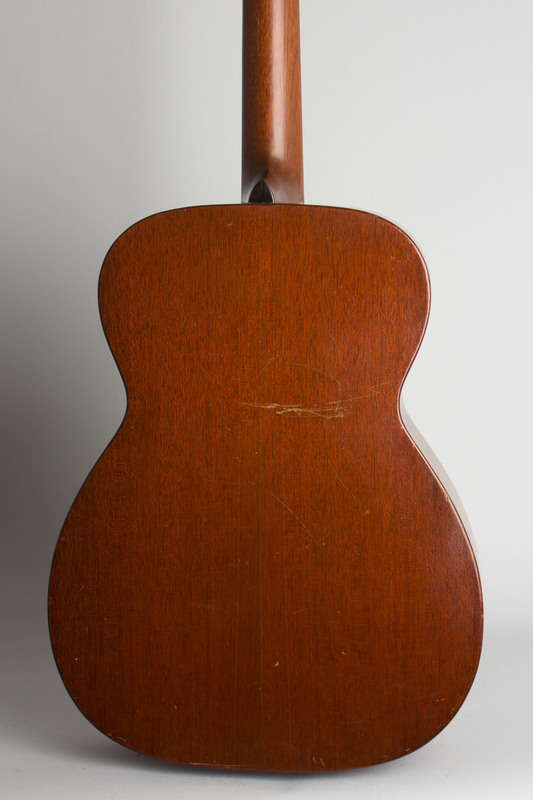 The 00-17 was the largest and most expensive of the all-mahogany Martins of the 1940s, which were Martin's budget guitar offerings of the period. Despite the wartime austerity, guitars of this period were still built to the same quality standards as Martin always maintained. 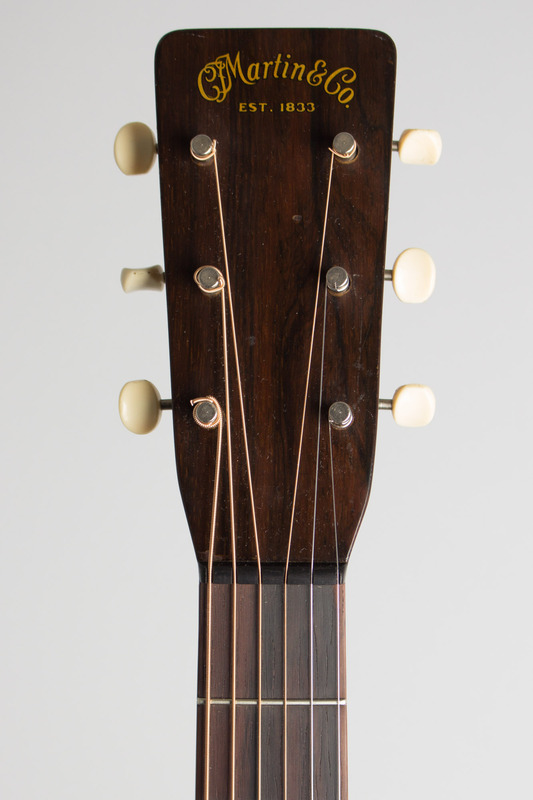 The 00-17 has a lightly braced all-mahogany body with only minimal decoration: no binding anywhere, a 5-ply sound hole ring, and small dot fingerboard inlay. 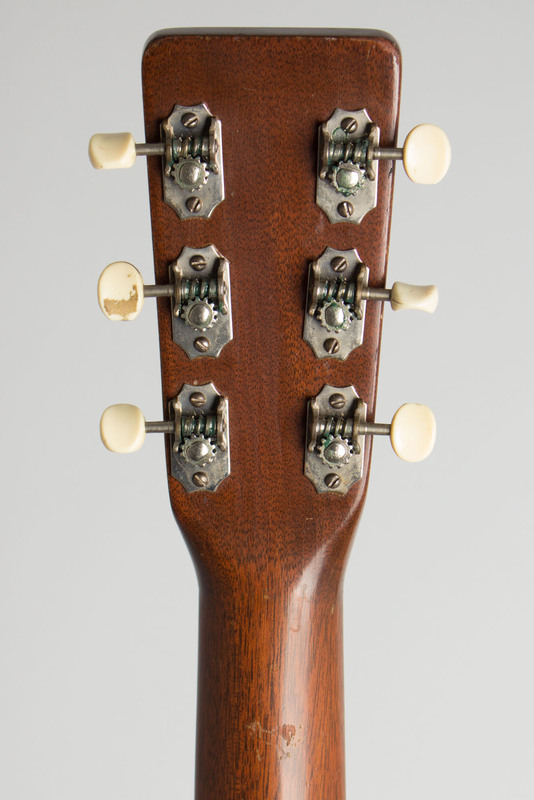 Typical features for this year include the openback wartime Kluson tuning pegs with thin riveted gears and no bushings, a small straight rosewood bridge, and tortoise celluloid pickguard. 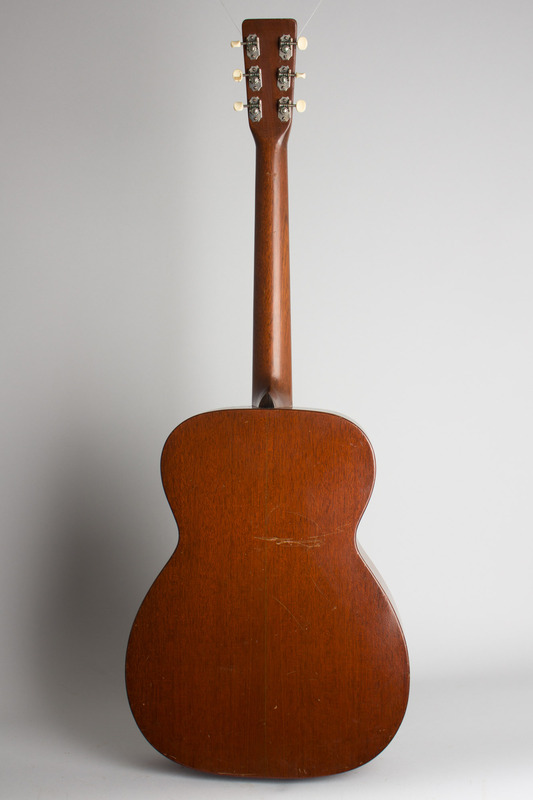 This guitar cost $40 in 1945 (without the case), and a total of 525 were shipped that year. These mahogany-top Martin guitars have aged extremely well, especially considering their budget origins. 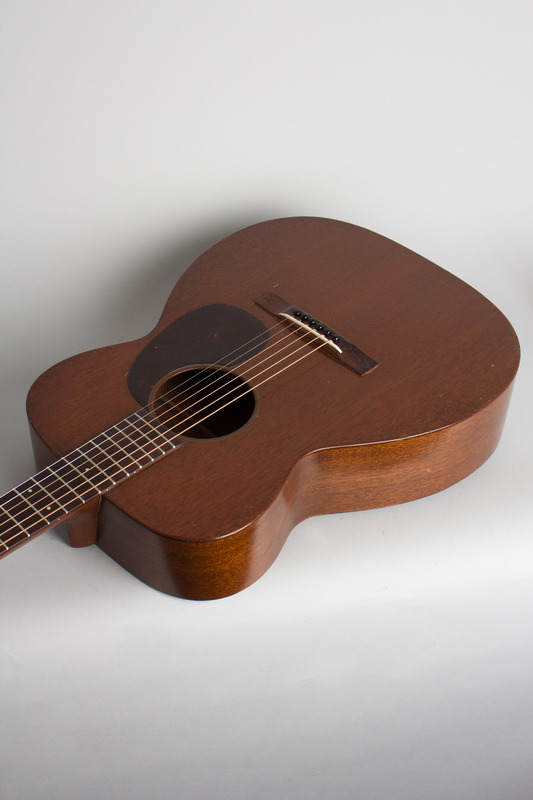 They offer a distinctive crisper ringing tone and are generally considered excellent fingerpicking instruments, this example with the more lightly braced 1940s top especially so. The 00-17 records very well and also makes for an excellent singer-songwriter's instrument; a classic vintage Martin that won't break the bank. Overall length is 38 13/16 in. (98.6 cm. ), 14 1/4 in. (36.2 cm.) wide at lower bout, and 4 in. (10.2 cm.) in depth at side, taken at the end block. Scale length is 24 3/4 in. (629 mm.). Width of nut is 1 11/16 in. (43 mm.). this is a very clean guitar overall, not showing any major wear. The top has small dings and dents and the back and sides some larger scrapes but there is very little pickwear compared to most Martins this old. There are a few dents in the side just below the neck heel that would imply a previous owner wore a pinky ring. There are also no cracks anywhere, which is kind of amazing! 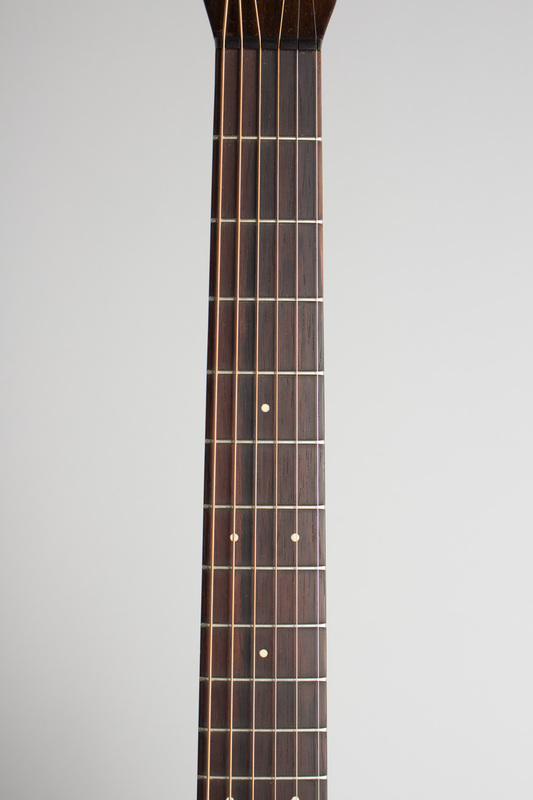 The guitar has had a neck reset and plays extremely well; the bridge may have been lowered just a hair long ago. Another lovely sounding Wartime mahogany martin proof that the boys in Nazareth never let their standards slip, even in the most trying of times. Excellent - Condition.